The advanced SureFire SFMB-556-1/2-28 muzzle brake, which fits M4 / M16 weapons and variants with 1/2-28 muzzle threads, greatly reduces both recoil impulse and muzzle rise so that the weapon tracks straight back to keep you on target for faster shot-to-shot recovery. Its patented Impulse Diffusion design minimizes side blast and rear-directed concussion effects. The SFMB-556-1/2-28 also serves as a rock-solid mounting adapter for SureFire SOCOM Series 5.56 mm Fast-Attach® suppressors, the SOCOM556-RC model having placed first in the most extensive and rigorous suppressor testing ever conducted by US Special Operations Command. Precision machined from US mill-certified heat-treated stainless steel bar stock—including high-precision single-point cut threads for optimum thread interface—the SFMB-556-1/2-28 muzzle brake is given a black Ionbond DLC coating to provide maximum protection under harsh environmental conditions and to facilitate cleaning even after extreme use. When used in conjunction with a SOCOM Series suppressor, the patent-pending design of the SFMB-556-1/2-28 provides multiple bearing surfaces to ensure superior suppressor alignment. A rear labyrinth seal minimizes potential carbon buildup in the indexing system and facilitates suppressor removal after extended firing. 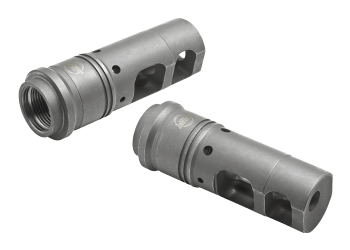 All SureFire SOCOM Series muzzle brakes have blind pilot holes at the 3 and 9 o’clock position to enable fine-tuning of recoil characteristics for individual shooting styles or ammunition characteristics. They also have blind pilot holes at the 6 o’clock position to enable indexing the adapter at bottom dead center, and to pin-and-weld on short-barreled rifles. All that is required is a basic hand drill and appropriate drill bits. SureFire muzzle brakes are individually inspected for concentricity and alignment, and each is covered by SureFire’s No-Hassle Guarantee. 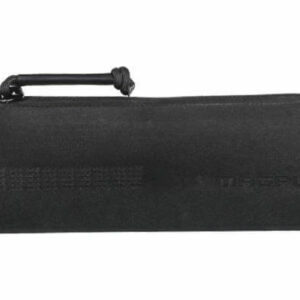 FITS: M4, M16 and variants wih 1/2-28 muzzle threads MOUNTS: All SureFire SOCOM Series 5.56mm/.223 caliber sound suppressors NOTE: SureFire SOCOM Series Fast-Attach sound suppressors and current-model muzzle brake/suppressor adapters and flash hider/suppressor adapters are not compatible with previous SureFire Fast-Attach sound suppressors, muzzle brakes, or flash hiders.